New! Our Two's A Party Duo Eyeliner Stencil Set includes 2 sets of eyeliner and eye makeup stencils so you're never without. Plus 2 professional medium sized Beth Bender Beauty eye shadow brushes and our Beth Bender Beauty signature water-resistant neoprene zippered pouches. What's better than one set of Eyeliner Stencils a la Carte? Two sets of Eyeliner Stencils a la Carte and this set comes with two brushes. So you can share with a bestie, sister, or keep as an extra set so you're never without. Our eye makeup & eyeliner stencils can be used for creating numerous eye makeup styles, like a simple line along the eyelid, a classic cat-eye or sultry smokey eye, and a trendy winged eyeliner look in any thickness all in just seconds. The only eye makeup tool that allows you to achieve endless eye styles without the help of a professional makeup artist. These one-of-a-kind eyeliner and eyeshadow makeup stencils are flexible and designed to fit any eye shape and eye size. They can be used with most eye makeup products to create the look you desire day or night. And the best part, you can do them yourself with PRO results. For winged eyeliner or a classic cat eyeliner look, take your cat eye makeup stencil and place it over your eyelid. Make sure it fits comfortably over the eye with your lashes poking through the cat eye shape. 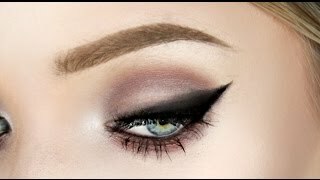 Holding in place with your your index and middle fingers, fill cat-eye shape in with your shadow beginning at the inner corner and working the color out to the cat-eye point For a thicker, more dramatic winged liner look you’ll need to place your cat eye stencil shape above the lashline. If you're not sure of where to apply your eye color for creating a style you can use the black guidelines that follow each shape. If you want to intensify your eyeliner look, dampen the brush before dipping into your shadow with an eyeliner sealant or a drop of water. 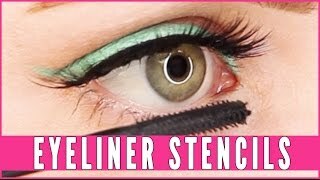 Make sure to wipe your eyeliner stencil clean with a soft tissue or a baby wipe before moving to the other eye. Repeat the same steps. *For the best results when using our eyeliner and eye makeup stencils we recommend using an eyeshadow first to create the desired shape and style and then setting with your liquid or gel liner. SO HAPPY WITH MY STENCILS! !